On either side of the great rock pile are beaches. The one by the entrance to the Caves is simply referred to as Baths Beach. On the far side of the Caves is the somewhat larger Devil's Bay Beach. 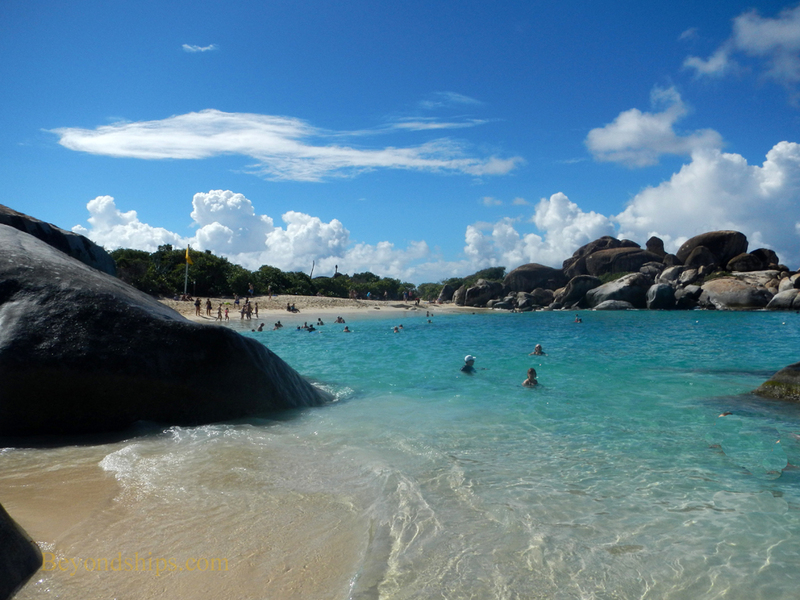 Both are white sand beaches dotted with granite boulders. Similarly, at either end of both beaches are tall rock formations that mark their outer boundaries. The sea can be quite turbulent at these beaches with the waves gathering force as they funnel through the openings in the rocks. A flag system is used to warn visitors when the beach is closed and of other hazards. 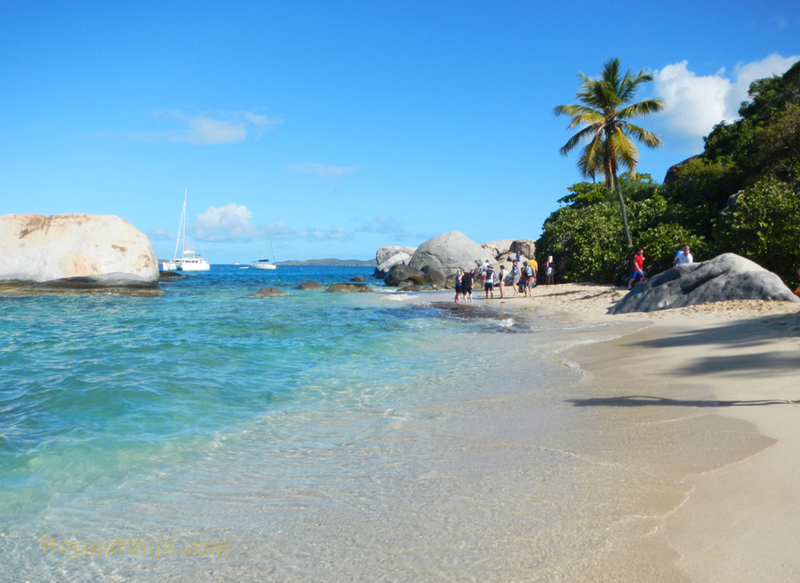 There are toilet facilities and lockers at the Baths Beach but not at Devil's Bay. It is not easy to go between the two beaches as the only direct route is through the Caves. Yachts can often be seen moored offshore. Their sailors must swim ashore as dingys are not allowed on the beaches. Above and Above left: Baths Beach. Cruise ships calling at Roadtown, Tortola routinely offer a shore excursion to the Baths. The catamaran leaves from the new cruise ship complex. 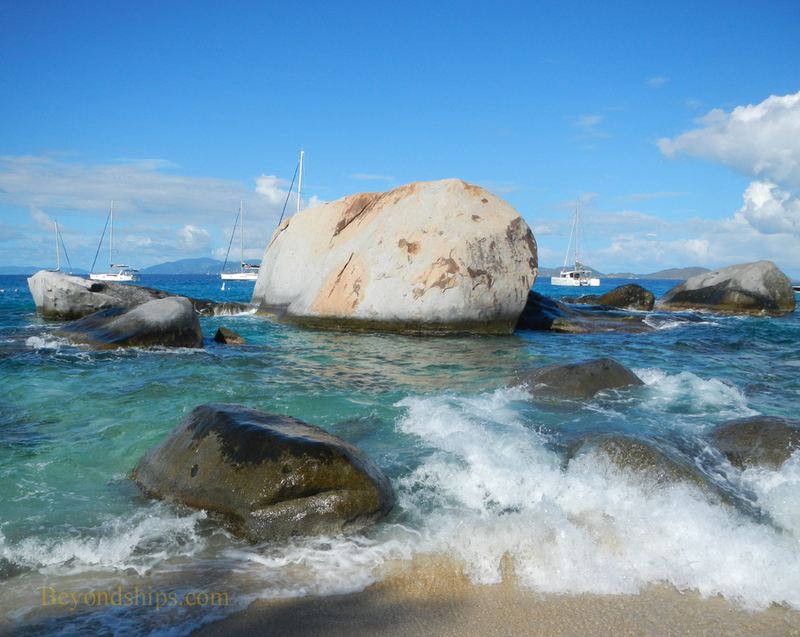 It is about a 40 minute ride to Virgin Gorda. Upon arrival, you board safari trucks, which take you on a 20 minute ride to the Baths and Devil's Bay National Park. It is also possible to travel to the Baths independently. Ferries run from Roadtown to Spanish Town on Virgin Gorda. From the ferry pier, take a taxi to the National Park. This may be a less expensive way of visiting the Baths but in going independently you assume the risks of ferries not running and of taxis not being available. Whether going with a shore excursion or traveling independently, you only ride as far as the National Park visitor center. Set atop a hill, the buildings here include toilet facilities, a shelter and a restaurant. From here, you walk down a dirt trail to the Baths. Similarly, in order to get back to the visitor center from Devil's Bay, you have to walk another trail. On either side of the trails is dense vegetation and the occasional boulder or rock formation. The trails are uneven and sometimes narrow. In places there are rocks and slippery surfaces. When we were there, a visitor felt herself slipping on a rock and naturally reached out to grab the vegetation growing along the trail to steady herself. Unfortunately, the vegetation was one of the many cactus that grow along the side of trail. As noted earlier, the Baths is a popular tourist attraction. It attracts tourists visiting the British Virgin Islands, yachtsmen and cruise passengers. Consequently, there can be quite a few people. Still, if you wait for the crowd to thin out, you can have moments alone in the Caves. Also, the beaches are not as crowded as some of the more popular Caribbean beaches. The trails to and from the Baths go through an arid but scenic wilderness.